Who cares if the world is not a perfect ball? You should, for one. Knowing the exact shape of the Earth keeps satellites in place, keeps your GPS navigator working, and keeps you from the dehumanizing torture of asking someone for directions. And the knowledge that the planet lacks a perfect shape… well, maybe that excuses a person’s own lack of physical perfection. But that metaphysical implication was much more serious centuries ago. The lack of perfection in the shape of our planet became an item of debate when Sir Isaac thrust a needle into our ancestors’ collective ego balloon. Society was no longer free to imagine the world as a blob of perfection. measurement was closely approximated at 1/297 in 1948 by Sir Harold Jeffreys, a brilliant geophysicist (and adamant, vociferous drift denier). Today, the WGS84 survey system uses the less approximate 1/298.257223563. It’s the decimals that keep satellites in stationary orbit and help Google’s Earth draw street overlays on streets instead of neighbouring rail tracks. Later scientists not only refined the fraction, but they also refined Newton’s model of our planet’s figure. Geodesy has taken us from the Greek’s perfect sphere to Newton’s perfect oblate spheroid to today’s deformed orb with highs and lows unevenly distributed around the surface. But you would hardly notice a difference on a drive around the planet. A trip looping the equator would entail 40,075 kilometres. A north-south trip from pole to pole and back again is just 66 kilometres shorter. The perturbations that distort the oblate are even less obvious. In our ordinary experiences, it makes no difference that the Earth is not a perfect sphere, or that it is a pimply oblate spheroid. But whenever satellites are launched, our imperfectly-shaped planet forces complex calculations upon their orbits. An accurate measurement of the planet’s shape defines satellite orbits more perfectly. This makes global positioning from satellites possible, improves street maps, makes communications more stable, and aviation safer. To understand why the Earth is flat on top and bottom, but bulgy in the middle, imagine a whirling dervish, if you will. 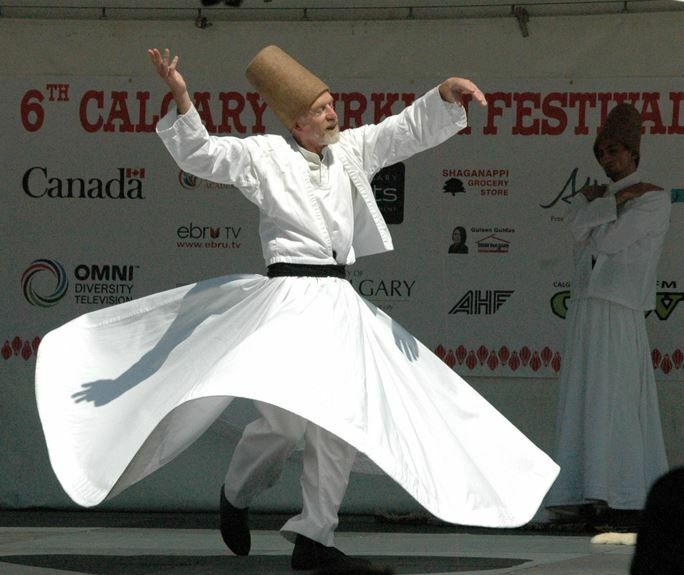 As the Sufi spins faster, his white gown expands away from the waist. The whirling Earth is similar, its waist puffs out at the equator. By the way, the mass of the Earth is so enormous and angular momentum is so great that if the Earth’s energy of rotation could be harnessed, the power captured would light all the world’s cities. Engineering students sometimes calculate the Earth’s power of rotation during their first physics classes. Then they make proposals on how to convert that angular momentum into useful energy. Just applying a small brake – slowing the Earth down so each day stretches one second longer – would yield enough energy to power all of the globe’s human activities. And we’d probably appreciate the extra second every day. All this power is simply from the energy of rotation, which is busy flattening the poles, bulging the Earth’s belly, and (due to rotation’s effect on tidal bulges) edging the moon deeper into space. – an excerpt from The Mountain Mystery book. This entry was posted in History and tagged geodesy, Newton. Bookmark the permalink.